Safe mail handling procedures tackle massive powder-laced letter hoax - Sentry Air Systems, Inc.
A North Texas man made headlines recently following his arrest for allegedly mailing more than 500 letters containing a non-toxic white powdery substance to schools, government offices, day care centers, and hotels across the nation, as well as U.S. Embassies abroad. This story comes on the heels of a similar case where a female actress pled guilty to mailing letters laced with the biological toxin ricin to top government officials. Both cases shine a light on the importance of safe mail handling procedures. According to the U.S. Department of Homeland Security’s Interagency Security Committee (ISC), the U.S. government processes hundreds of billions of pieces of mail each year. While most pieces are handled without incident, the threat of biological or explosive material is real, thus federal agencies must prepare for the worst case scenario. The ISC compiled a document entitled Best Practices for Safe Mail Handling. This document makes numerous safety and preventative recommendations for mail processing facilities including basic and enhanced steps for mail handling operations. An industrial vacuum cleaner equipped with a high-efficiency particulate air (HEPA) filter for cleaning high-speed, mail-sorting machinery and local exhaust ventilation at pinch roller areas. Filtered exhaust hoods installed in areas where dust is generated. Air curtains (using laminar flow) installed in areas where large amounts of mail are processed. Filters installed in the building’s HVAC systems to capture aerosolized spores. While explosives are a major threat, powder and air contaminates can be just as dangerous. Even the slightest agitation can make fine particulate matter airborne, compromising the room air and potentially exposing workers to inhalation of hazardous toxins. Sentry Air Systems offers a variety of engineering safety control solutions that are modular, portable, energy-efficient and easy to use. Our most popular solution is a Ductless Containment Hood. The hood comes in a variety of sizes and is equipped with a powerful fan that pulls powder and particulate away from the operator’s breathing zone and into the HEPA filter chamber. The filter arrests these hazardous particles before they are able to recirculate into the ambient room air. 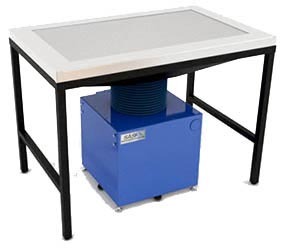 The variable speed knob gives the operator control over the amount of airflow, and optional vinyl strip curtains can attach to the lid opening for greater particulate control. For environments that require exhaust through a building’s HVAC system or direct external venting, the same containment hood can be outfitted with our plenum attachment for easy ducting. The modular design of our hoods allows for easy integration into most environments and can easily be modified for unique applications. An alternate option is a down draft table for oversized or bulk packages. These negative pressure systems pull air through the slotted work surface and into the filter chamber before recirculating cleansed air back into the room. Sentry Air Systems is pleased to have supplied mail processing containment hoods to a variety of state and federal agencies. For more information, you can read our other blogs relating to this topic, here. If you have any questions or would like to receive a free quote, contact Sentry Air at 800.799.4609, email sales@sentryair.com, visit our website or fill out the feedback form below.